I lol'd at the main image in the header. Is that a Ninja convention? Oh wait, it's just Islam. What a shame we're tied to this crap. Honestly, I dream of a America that never has to concern itself with the Middle East. Just let America look after itself for once. As much as I accept that the House of Saud is the devil we know, I'm glad Congress took its balls out of its purse for the first time in my entire life, and stood up to the POTUS on ending a military conflict. I still maintain that the most valuable thing the Trump administration will teach our society is the proper authority the POTUS is supposed to have, which isn't much. This really really goes against the whole "fighting radical islamic terrorism" angle like...A LOT. Providing weapons to the country that exports aforementioned terrorism so they can bomb a small country out of sheer hatred will only result in people from Yemen emigrating to other countries, and radicalising others. But I guess continuing to arm Saudi is more important from an ally and money standpoint than actually standing behind one's principles. Obama and Trump cabinets have blood on their hands, the whole lot of them. This war keeps American troops out of harms way. It’s a proxy war that is relatively contained between the Saudis and Iran. Let them fight. We’ll keep selling weapons- if we don’t China and Russia will. It was never a secret that Trump is a whore of the Israeli-Saudi duopoly, like every other US president post 1960's. The only reason Congress is pretending to want to end involvement is because they know Trump will veto their measure. There was zero pretense when Obama was supplying arms to the Saudis. The entire US establishment is rotten to the core. This is just more stunts for public consumption and cheap political point-scoring. Yet... American troops are on the ground there. Giving people around the world legitimate reasons to hate us and seek revenge doesn't sound very safe to me. Doing what every other US president would do, even if he is getting arab money. These are people who will hate the Western infidel who made and sold a weapon more then the believer who used the weapon. There is no way to avoid that hate, it's a cornerstone of their culture. I wonder if you'd feel the same way if the Soviet Union and China had been bombing North America for the last 30 years. Does America also have several civil wars between North and South in this scenario ? Possibly, but for equivalence's sake, you should assume that the USSR and China have been orchestrating coups and arming factions underhandedly in order to spur those civil wars. Still not seeing anything remotely equivalent here. 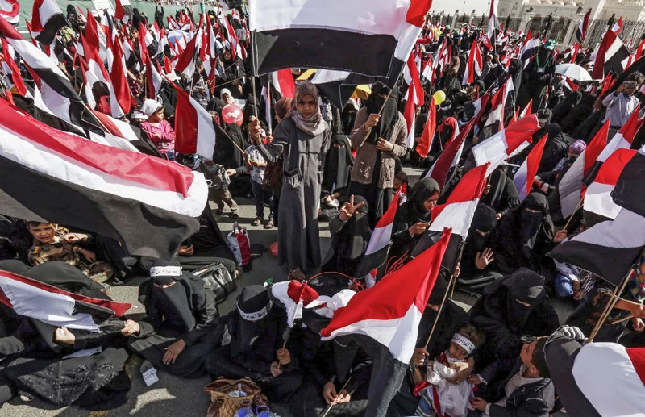 The current civil war in Yemen started with the coup against the sitting president by the Houthi faction in Yemen who have Death To America in their flag. The weapons they used came either from the stocks of the Yemen armed forces or Iran. Not exactly on the ground, but more for providing intelligence and mid air refueling operations. I still think the troops and any American should be brought home ... I HATE war... All it is is killing and harming your brothers and sisters. Now this is the sort of thing trump deserves to be bashed for. Hopefully one day oil will be nearly useless and that country can rot. One of the things he's done that I generally disagree with.